6 Signs You Are A Highly Sensitive Soul. If you are a highly sensitive soul, also known as highly sensitive person [HSP], you have known for quite a while that you are different from most people. You’ve more than likely been told by more than one person that you’re too sensitive or too emotional. As a child, you probably cried easily, had a highly active imagination and were very quiet or shy. You may have even thought that there is something wrong with you. Well, there isn’t. Being and HSP is something you should never feel ashamed of. HSPs are highly nurturing people who feel emotions very deeply and appreciate the subtle beauty in the world. They have huge hearts, are great listeners and are the best kind of friend to have. 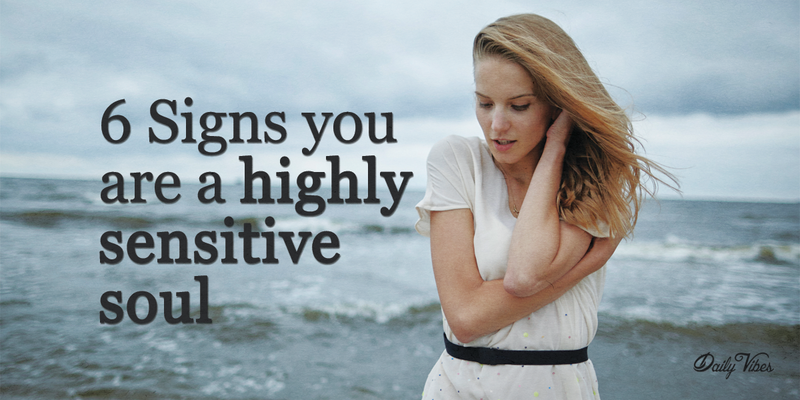 How do you know if you are a highly sensitive soul? Below are 5 signs that you are. HSPs have a very difficult time dealing with negative emotions. Raised voices, anger and conflict send you running. You feel almost physically sick by negative emotions and crave quiet and calm. You also avoid negative media images and stories, as well as, violent movies and TV shows. Your sensitive soul just cannot tolerate seeing violence and suffering. Your gut feelings are almost always right. You seem to know things without being told and sense things that are about to happen. You know as soon as you enter a room what the mood of the environment is. You’re highly attuned to the emotions of others and know how they’re feeling before they even tell you. Because you are constantly being bombarded by the feelings and emotions of others, you get worn down. You often feel drained, tired or exhausted. You may have even been diagnosed with Chronic Fatigue Syndrome. You’re overwhelmed by bright lights, loud noises and large crowds. You can’t tolerate strong smells and rough fabrics. You get rattled when there is too much coming at you at once. Because of this, you arrange your schedule and commitments in order to avoid chaotic or overly stimulating situations. You are highly creative, imaginative, and loving. You have chosen the arts or some other career that allows you to have a creative outlet. You feel close to animals and especially enjoy your relationship with your pets. In fact, you’d rather be around your pets than people. You have a rich imagination and can spend an entire day thinking or day-dreaming. People often comment to you on how sensitive you are. They say you’re overly sensitive or wear your heart on your sleeve. People tell you that they don’t even notice the things that you instinctively pick up on. You are also told that you’re the best listener, so people come to you to talk about their problems. Only those closest to you will understand your unique need to have alone time, to avoid crowds and your emotional sensitivities.